So with my wife nagging about all the Arduino parts, sensors, resistors,caps, etc. laying around not getting used for anything I decided to get back into doing my 7" TFT Reef Angel diy style from scratch with the main focus being her weather station. 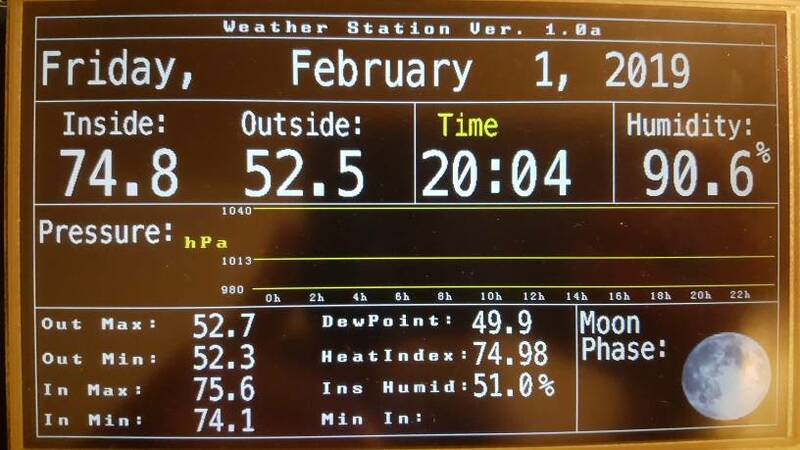 As of right now the weather station is 60% done. Until I figure out how to calculate readings from the pressure sensor to "forecast" the day, as well as pull information from the net using an esp8266 for the next three days. Am still playing around with the GUI and trying to figure out why the moon phase isn't displaying the correct phase just yet. But next couple days I'll be adding more display screens for the 3day forecast as well as the RA's information.